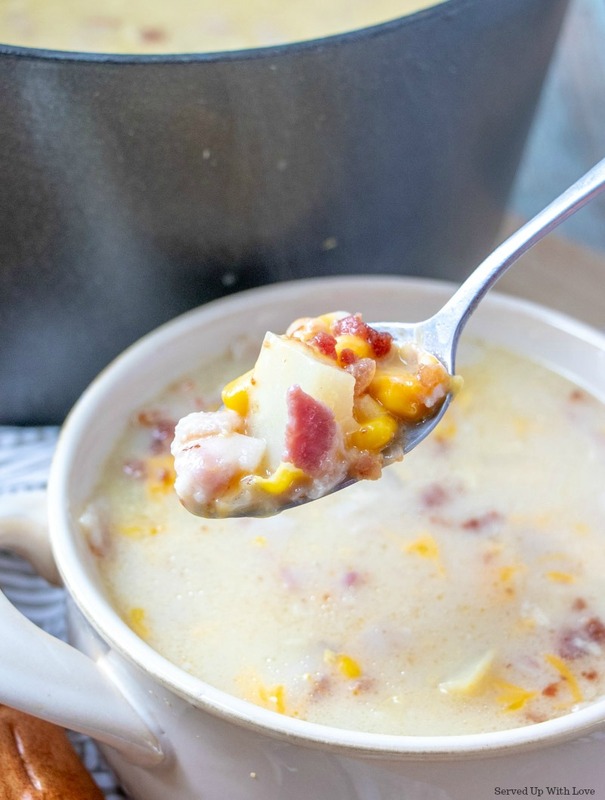 When the days start to get chilly my mind starts to wander to warm and comforting soups and stews like this Bacon & Corn Chowder. 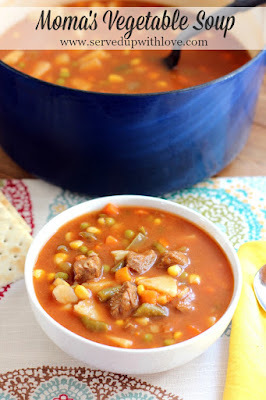 I am a huge soup lover and tend to make a lot during the colder months and then I miss it when it starts to warm up. Every year we play a game, how long can we last before we turn the heat on? Tell me I am not the only one. 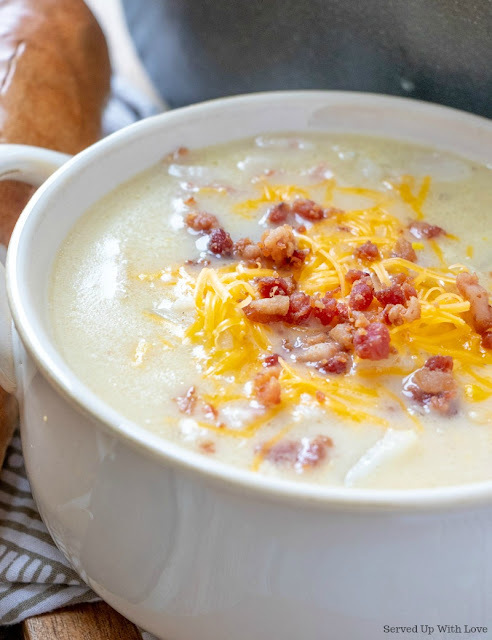 I had thought of this soup for weeks but for one reason or another I wasn't able to make it. My husband wanted bacon and eggs for dinner but I just wasn't feeling it on that night. My husband is not a fan of trying something new so I always get resistance when I mention a new recipe. Since we were already using bacon I knew this was my chance. So I took a few of his pieces of bacon and went to work. I just threw this together and I was very pleased at how it turned out. The next day was even better. The smokiness of the bacon paired with the sweetness of the corn were great together. The little punch of heat from the cayenne pepper was a nice little kick too. 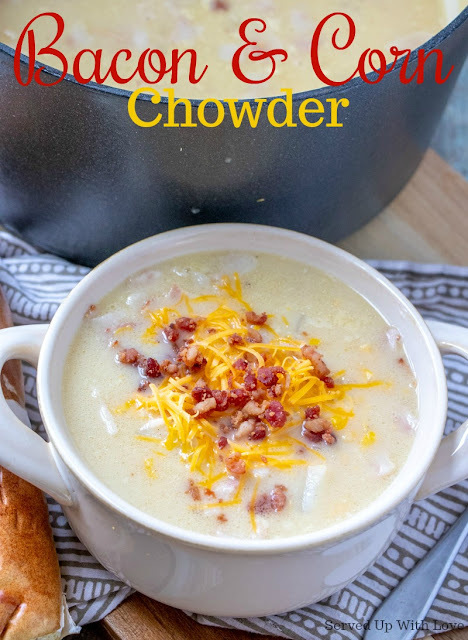 I topped mine with shredded cheddar and some crumbled bacon. This has become a huge family favorite recipe that is super comforting. Its perfect for cool, crisp days when you just need a hug from the inside. Besides, bacon just makes everything taste better. 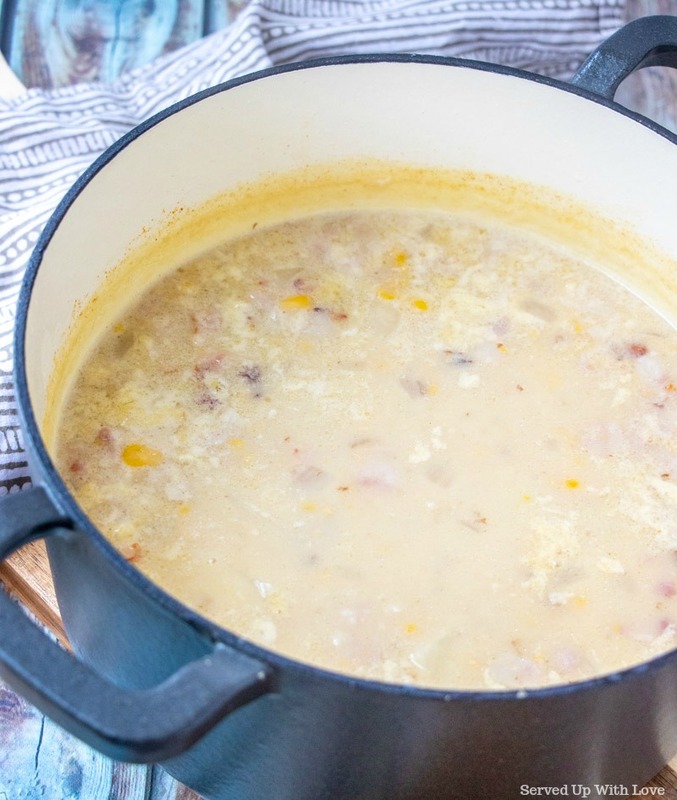 Smoky bacon and sweet corn pair together to make a warm and comforting soup the entire family will love. 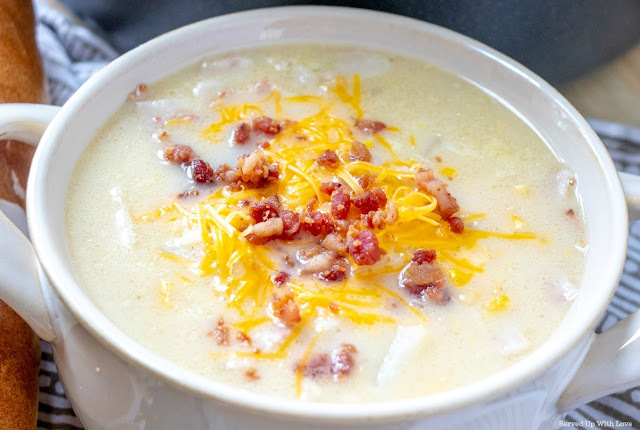 Optional toppings: shredded cheddar cheese, crumbled bacon. 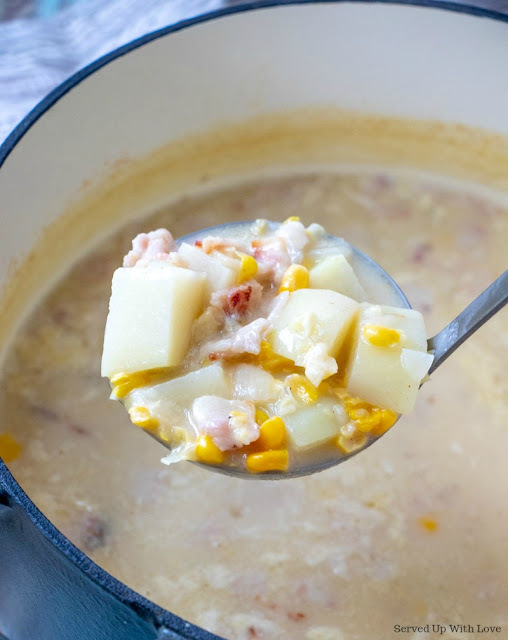 Chop the bacon into smaller pieces and place in a large sauce pan, such as stock pot or dutch oven, with the vegetable oil. Add the diced onion and cook the bacon and onion until bacon is cooked but not too crispy. Once done, add the butter until melted, then stir in the flour. Stir until combined, next add the chicken broth and the remaining ingredients. Cook on medium heat for 30 minutes, stirring occasionally. Oh I LOVE this! Too bad your hubby isn't willing to TRY...I'd be dead meat if my hubby wasn't willing to try something new. =) More for you, right? I totally agree - Bacon makes everything taste better. Thanks a million for sharing with us at Weekend Potluck. Have a blessed week ahead. Thanks Marsha, I was hoping the bacon would lure him in but oh well, next time. Thanks for stopping by. I made this today for my husbands's weekly Sunday foorball and left it in the crockpot on low until time to eat. It was a hit with all those big ol'guys! Thanks so much for sharing the recipe! The only thing I did different was use 1/2 an 1/2 instead of milk, stirred in a bag of cheddar cheese, and topped it with chopped green onions. That is great Kelly! Anything with bacon is sure to please the guys. 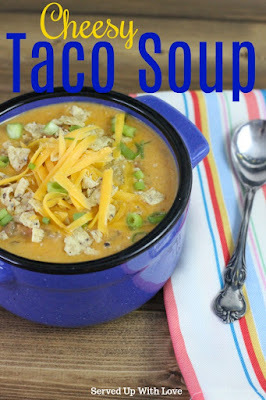 I am so glad it was a hit and I will have to do this in the crock pot next time. I adore my crock pot for sure. I love your changes. I bet it was super good! Thanks for stopping by and letting me know how it turned out for you. I am sure it was the hit of the party! Thanks for another great recipe! This was absolutely delicious on a cold, rainy day. And so easy to put together. You make my life much easier! That is so great to hear! Glad you enjoyed it and took the time to let us know!